I thought I’d try something new today and give a review a go. There’s a new cafe just up the road from my work that, as soon as I heard about it, had me pretty excited. 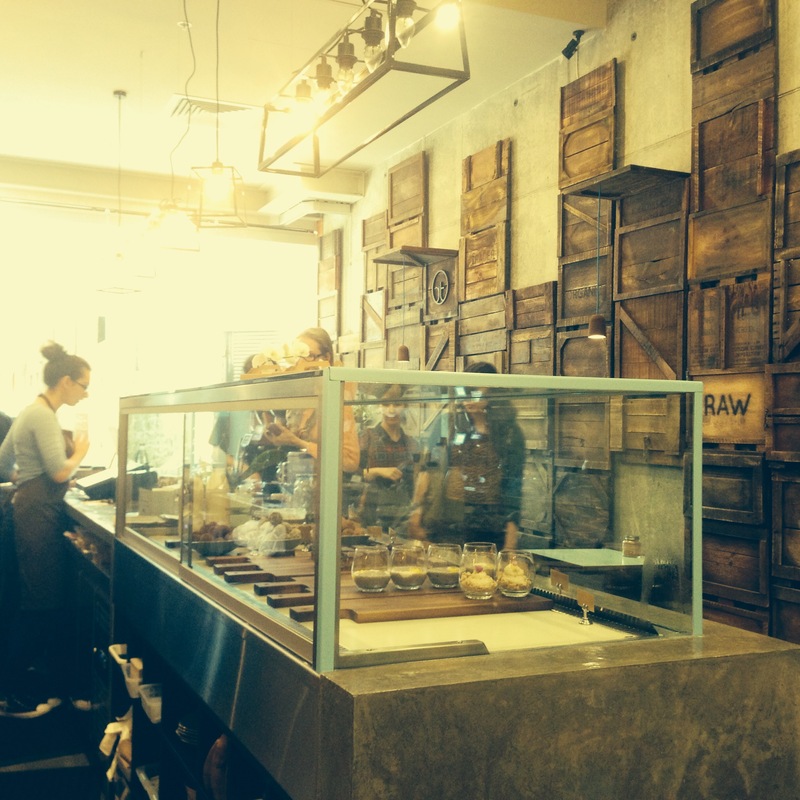 It’s called Raw Trader and you can find it at 10 Sutherland Street, Melbourne. 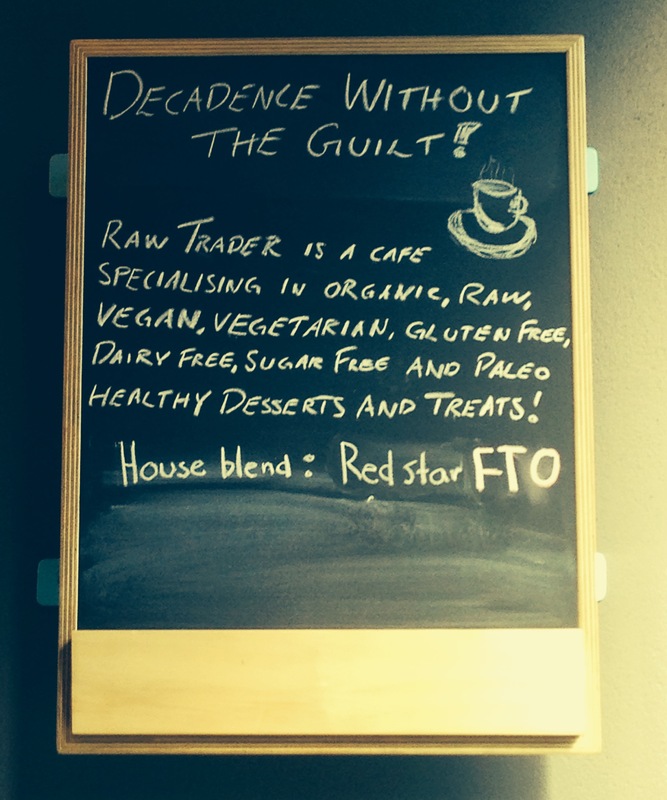 Raw Trader is, in their own words, a cafe specialising in organic, vegan, vegetarian, gluten free, dairy free, sugar free and paleo healthy desserts and treats. I’ve been there three times now, trying different parts of the menu each time. There’s no set list of desserts on sale here- they have different items for sale each day, depending on what’s they’ve made and what’s fresh. They’ve only been open for a couple of months, so I suspect that as they get to know which of the desserts are crowd pleasers we’ll see some items appearing more regularly. The first thing I should say about their food is this: I haven’t eaten refined sugar now for nearly 7 weeks, and it’s fair to say that my tastebuds have changed. 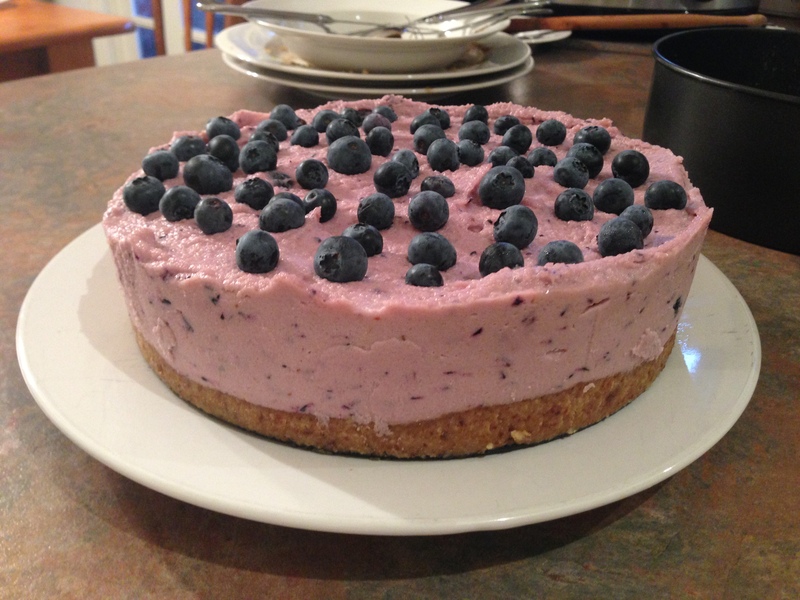 Raw Trader’s food is delicious, but don’t expect their passionfruit mango cheesecake to taste like normal cheesecake- it’s going to be a lot less sweet, and it’s going to taste a lot more like cashews than your average cheesecake. That works for me and my tastebuds- it mightn’t work for you. But it’s still delicious. In fact, their food very much tastes like the kind of raw dessert you could (should you choose to be bothered), produce at home. When I visited with my mum she was a bit off-put by that, but I really like that I don’t have to buy, soak and blend expensive organic nuts, cocao and dates in order to get a raw dessert fix. Price-wise Raw Trader’s really quite reasonable too. Considering you’d pay in excess of $7 for a giant piece of mass-produced Mars Bar Cake anywhere else in the city, their cakes and bliss balls (ranging from $4 – $8ish) are definitely not too expensive. Given how rich these foods are, their portions are very generous too. When it comes to drinks, Raw Trader offers a very drinkable coffee blend with standard milk offerings as well as house-made almond milk. My first coffee with the almond milk was really exceptional- creamy, rich, sweet- but my second tasted really sour. Maybe I got an off batch of milk? I’m not sure. They also offer great looking smoothies, although I haven’t tried them. Despite all the positives about the food, the one other thing I would say about Raw Trader is that right now their service is pretty poor. It’s a small space, and word’s certainly got out about it already, so their standard two staff never seem to be enough. Drink orders get mixed up and food orders are forgotten right now- I think they’re going to have to step this up in the future to stay with the very competitive Melbourne cafe culture pack. But despite what I’ve said about the service (and it really hasn’t improved at all in the three visits I’ve made), I will continue to go back to Raw Trader and I highly recommend that anyone that’s in that area of Melbourne drop by for and Almond latte and a Bliss Ball. 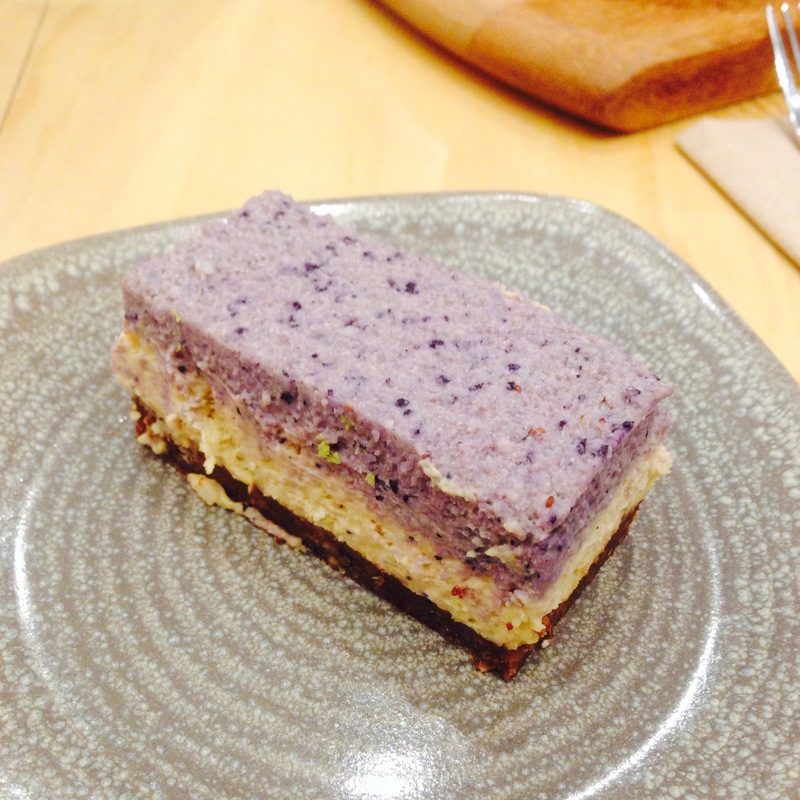 The food is really good, and it’s really nice to have a cafe in that area of the CBD doing what they’re doing. P.S- please excuse my fairly dodgy phone photos! !